A+++ service and results. I called a number of places to get an estimate to have my driveway resurfaced. Some didn’t even bother to respond. But Asphalt Services was prompt in giving the estimate and the price was very fair. They arrived when they said they would, and the results are phenomenal! No “stripes” like we’ve had in the past. It looks like a brand new driveway! Plus, the customer service was great! They promised to do the work within a very reasonable week of the estimate. But I asked if they could do the work sooner, and they juggled their schedule so that they could accommodate my timeline. Wonderful all around!!! They did an excellent job and made sure that they cleaned up when they finished. Totally professional people to deal with and asked for my input of what I wanted and followed it to a T. I would gladly refer them to my friends to have them do their magic. Everyone from Chris, Rose and Lee, not to forget the crew, were very courteous and friendly. What more can I say? Asphalt Services did an excellent one-day job of demolishing and removing our old driveway and repaving it. They were friendly, responsive and very efficient. They overcame a very confusing and delayed city permit process and got the job done better than expected. I would highly recommend them to anyone considering a complete driveway rebuild! Excellent work! Driveway looks great, and they did minimal damage to the lawn and the walkway. They dug it out on a Saturday, and put a new one in on the following Monday. Crew was very efficient and left almost no mess behind. I have hired ASI of Woburn twice, once to pave a muddy and weedy parking area and once to seal coat an existing driveway. On both occasions, ASI showed up on time, did excellent work and through the office scheduler, Mary, provided excellent and flexible service. I recommend this company for its superlative work. Best of the best service! Everyone from the estimator, Chris, to Jeff running the job, to Rose and Lee in the office were professional, nice and responded quickly to questions. We had an ancient one ripped out and a new driveway put in. When they say the truck will be there at 7AM – count on it. Count on attention to detail (did I mention my driveway has a delicate garden on 3 sides?) and craftsmanship. Clean – they left the area immaculate. They were even cleaning up during the job! Ask for Jeff who was our contact the day the driveway was put in. Very professional, friendly and on top everything. ASInc responded immediately to my request sending a reasonable quote. They quickly answered my questions when I called. Chris was my rep and was very responsive to any questions. I am happy with the work done. We were extremely pleased with the price, service and quality of the work done on our driveway. We have received many compliments. 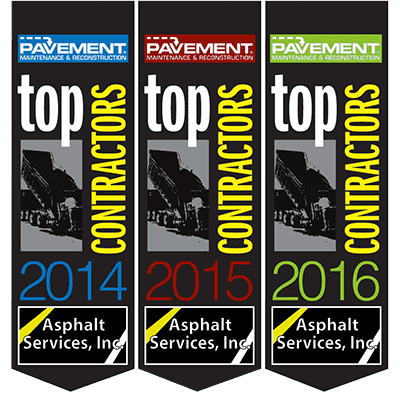 We would highly recommend Asphalt Services.